Wow this looks amazing! Can't wait to try it myself. 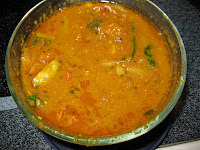 THe kuzumbu looks delicous Vidya, I must try it soon, take care! We usually go with Pitlai but this sounds wonderful! Great one Vidhya! Never thought abt this before. U r simply superb. Gonna to try this soon. 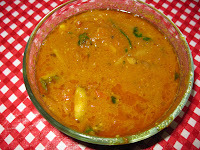 This is totally a new recipe to me.. looks spicy and yumm.. Will try that soon with the frozen bittergourd.